At noon on April 12th, in Brockton, a vehicle attempted to make a left turn onto Nilsson Avenue from Warren Avenue and collided into a Honda Accord and another driver. The vehicle fled the scene and Brockton Police later uncovered it on Fulton Street where they learned it was reported stolen prior to the accident. The triple car collision resulted in an injury the driver of the Honda Accord, who was ultimately hospitalized. The Honda Accord was smashed into a utility pole. There were several witnesses who gave their observations to the police. A driver who collides with another person, car or object and flees the scene is known as a hit-and-run driver. Such an accident can still be covered by insurance and the driver is liable to the injured person for physical and property damage. Ideally, the victim will want to remember or write down the make, model and license plate number of the car that flees. This information will allow your Massachusetts personal injury attorney to assist your insurance in finding the perpetrator. A victim of a hit-and-run accident may also be entitled to “punitive” damages. 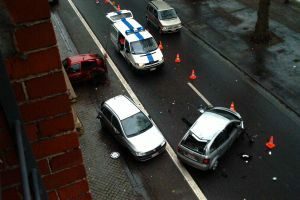 These are damages awarded to punish the driver and deter other drivers from simply running away from an accident scene. These damages are available because such an accident is the result of intentional or reckless actions by the hit-and-run driver. If you have been the victim of a hit-and-run accident you need a Massachusetts personal injury lawyer like the Law Offices of Jeffrey S. Glassman to make sure the police track down the suspect, and that you are compensated for your pain and suffering. Call us today at (617) 367-2900 for a free consultation at any time.